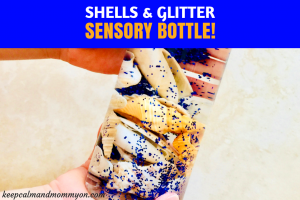 Are you looking for fun and stimulating DIY sensory bottle ideas to make for your child? Button sensory bottles are a great way to incorporate sensory stimulation into your child’s play! Our sensory creations started with us making sensory bins. We have made everything from the Vegetable Garden Sensory Bin to the Moana Sensory Bin. They are all a big hit with my kids! They love not only playing with them but helping me assemble them as well. This got me to thinking that it would be nice to have sensory activities that the kids could use not only at home, but while traveling and in the car as well! So we created sensory bottles! I think that sensory bottles will be a great addition to our Sensory Toy Bag for traveling! This button sensory bottle is full of many different colors and shapes. This is a great sensory bottle to help increase focus and concentration as your child searches for different colored and shaped buttons. Shake and turn the bottle to find new buttons and to feel the buttons slide back and forth in the bottle. A great sensory toy for kids! Another great thing about sensory bottles is that they are so easy to make! Button sensory bottles take less than five minutes to assemble! 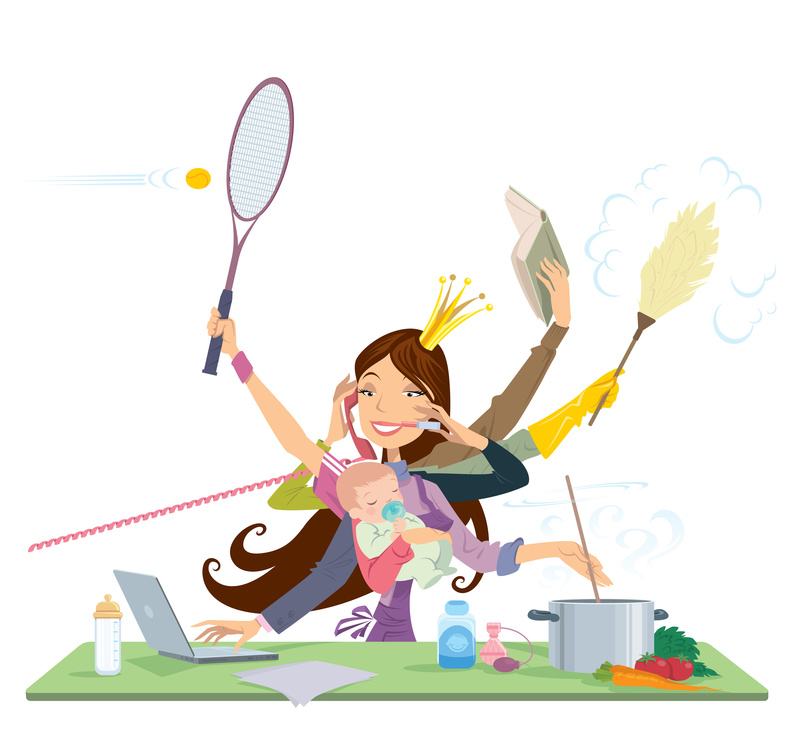 That’s right, five minutes to make something that will not only be fun but beneficial for your children. To make your sensory bottle, simply add the buttons to your bottle. I actually already had the buttons that we used to make our sensory bottle. Believe it or not the buttons we used are buttons that I collected as a little girl! As a little girl I would tag along with my mom and grandmother when they went clothes shopping. Let’s face it, clothes shopping is boring for little kids! 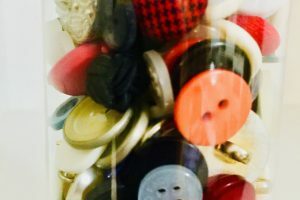 So, to pass the time I would look on the floor around the clothing racks and collect buttons, sequins, and jewels that had fallen off of clothes onto the floor. 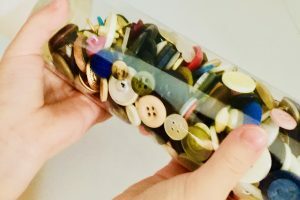 It was a great way to collect unique buttons and now I can use them with my kids making crafts and of course, sensory bottles! You do want to make sure that your buttons are small because the openings of the sensory bottles are not very big. If you want to use wider buttons then you will need to find a bottle with a larger opening. 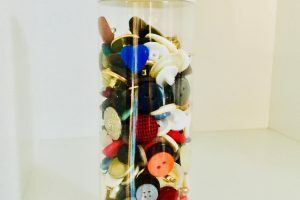 But you really don’t want buttons that are too big anyways, so that you can fit enough in the bottle and so that they can move freely. All that’s left now is to screw on the lid! 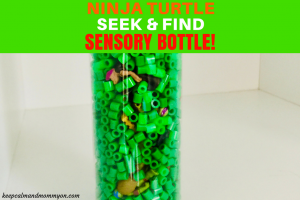 Now you have your own button seek and find sensory bottle! I hope you and your child enjoy the button sensory bottles as much as we do! 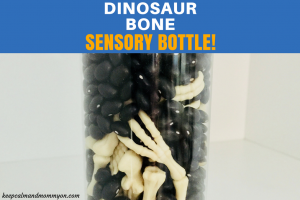 « Dinosaur Bones Sensory Bottles!